Eckart Preu will finish 15 years at the helm of the Spokane Symphony at the end of the 2018-19 season. The Spokane Symphony announced its five finalists to take over as music director when Eckart Preu heads on down the road at the end of the 2018-19 season. Each of the five finalists, drawn from 188 applicants, will come to town next season to conduct one of the symphony's classics concerts, as well as make the rounds of meeting symphony staff, supporters and musicians. Morihiko Nakahara — Hey, you know this guy! He's been resident conductor of the Spokane Symphony for the past 10 years after serving five years as associate conductor. He's also the director of orchestral studies at the University of Massachusetts-Amherst. 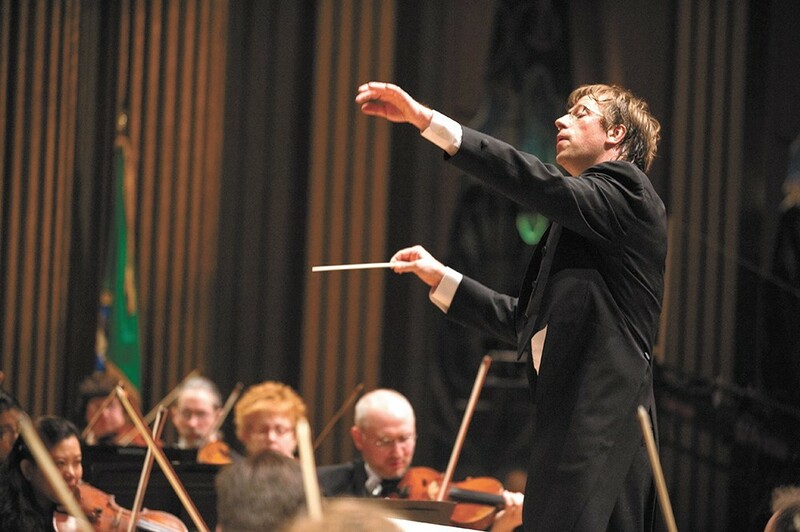 He'll conduct the symphony shows Oct. 6-7. James Lowe — Lowe is chief conductor of the Vaasa City Orchestra in Finland, and principal conductor for the Edinburgh Contemporary Music Ensemble in Scotland, where he was educated at the University of Edinburgh. Lowe will conduct the Spokane Symphony Feb. 16-17, 2019. Rei Hotada — She's the music director of the Fresno Philharmonic and the former associate conductor of the Utah Symphony and Dallas Symphony. She's apparently led orchestras from her piano in addition to the traditional podium and she has a Ph.D. in music arts from USC. Hotada will conduct the symphony March 9-10, 2019. Arthur Arnold — The Dutch-born Arnold is the music director of the Moscow Symphony Orchestra as well as the Pacific Region International Summer Music Academy (PRISMA) in Canada. He studied at the Accademia Chigiana in Siena, Italy. He'll conduct the symphony March 23-24, 2019. Jayce Ogren —Ogren is a Washington native and artistic director of Orchestra 2001 in Philadelphia, and was previously the assistant conductor of the Cleveland Orchestra and music director of the Cleveland Youth Orchestra. He studied at St. Olaf College, the New England Conservatory and Royal College of Music in Sweden. He'll conduct the symphony April 13-14, 2019.